If you want more than what the Maps application offers on your iPhone, then try JiWire Wi-Fi Finder. 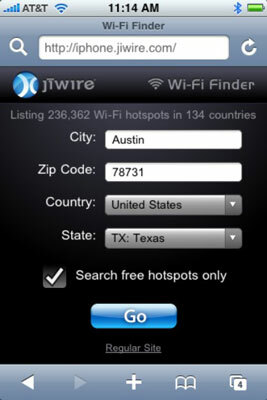 JiWire is a free app that makes it easy to search for hotspots in more than 150,000 locations in 135 countries. It also allows you to limit your search to free hotspots. JiWire Wi-Fi Finder is a great way to find Wi-Fi hotspots. After you download the app and tap the Go button, a list of hotspot locations appears. Tap the name of a found hotspot, and you see another screen with its name, address, phone number, and three buttons: Call, Map, and Info. The Call and Map buttons do what you’d expect: dial the phone number and display the location in the Maps application, respectively. But the Info button is the best; it tells you more about the business and the quality of its wireless network.